Here at the slots guru we don’t concentrate exclusively on slot machines and a quick glance at our Table Games page will demonstrate that our interests are many and varied. We’re constantly adding new reviews to all the sections and in this article we’re going to take a look at Pai Gow Poker from Playtech. Pai Gow is a form of poker derived from the original Chinese game which used Chinese dominoes instead of playing cards. Sam Torosian and Fred Wolf were the chaps who converted the original game into the western format and it’s a game which is now played in casinos all over the world. The rules of Pai Gow are pretty straight forward and the task is to make the best two poker hands from seven cards which are dealt. The hands must consist of one five card hand and one two card hand and the former must always be stronger than the latter. 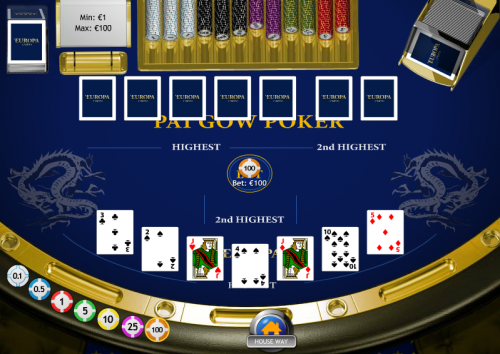 When you play this particular version of Pai Gow you are only competing against the dealer (a standard casino game would feature six players) so the gameplay is pretty straightforward. The first thing to do is to select your bet from the chips in the bottom left hand corner then click the ‘New Game’ button; seven cards will be dealt in front of you face up and seven face down in front of the dealer. Now you need to pick the two cards which will make up your weaker, two card hand; when this is done just click ‘Done’ and the both yours and the dealer’s hands will be separated and compared. You can also select ‘House Way’ at this point if you’d like the game to automatically pick the best options for you. If both your hands win you will be paid out at odds of just under 2/1; if one hand wins your chips will be returned and if the dealer wins both hands you will lose your stake. Now you can just press ‘Rebet’ if you’d like to continue. Playtech’s version of Pai Gow is a nice simple introduction for anyone who would like a stab at this interesting casino game. Like most poker variants the concept is simple but the strategy takes a long time to master.